Projects are one of the cornerstones of a successful business. Sector or industry aside, strategic initiatives focused on specific areas of the business are what helps drive an organization forward, growing, progressing, and evolving year after year. Also, implementing effective management reports will create a data-driven approach to making business decisions and obtaining sustainable business success. But despite the business-boosting potential (and vital importance) of successfully delivering collaborative strategies, a mere 58% of organizations understand the value of project management to its fullest, according to the global survey conducted by the Project Management Insitute. Armed with this knowledge, you can gain a significant edge on the competition. By taking an online data visualization approach to handling your company’s strategic activities, big or small, you will make your business more cohesive, collaborative, intelligent and profitable – and project management dashboards will help you do just that. Here, we explain the fundamental dynamics of project dashboard software, explore the benefits of project dashboards, and ask the question: what is a project dashboard? Exclusive Bonus Content: Upgrade your projects with our summary! Download right here our free guide and get started with dashboards! 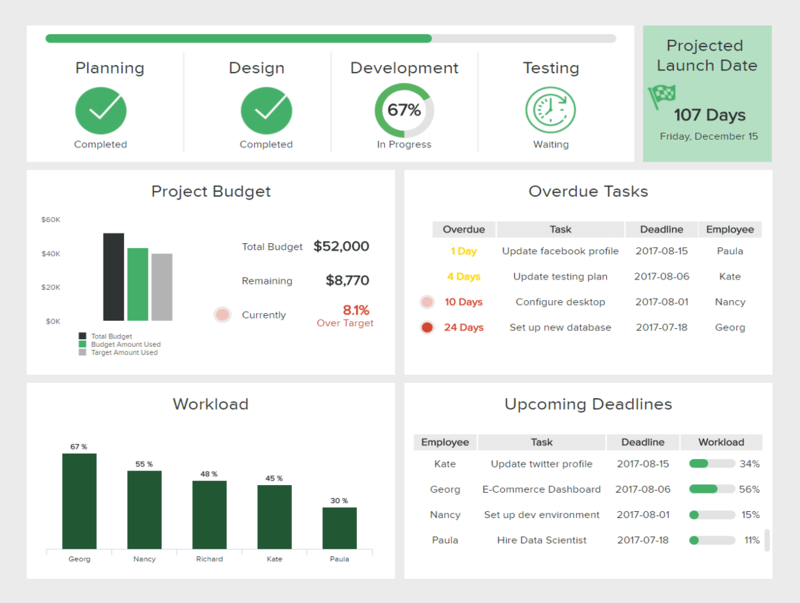 What Is A Project Management Dashboard? In essence, a project management dashboard is a data-driven platform that displays metrics, stats, and insights that are specific to a particular project or strategy by presenting a tailored mix of key performance indicators (KPIs) in one central location. A project management dashboard is perfect for individual departments looking to monitor the success of their projects and campaigns, spot past or present trends, and ultimately contribute to making the organization more intelligent. Project dashboard software is also effective for interdepartmental collaboration due to its flexible access and usability. 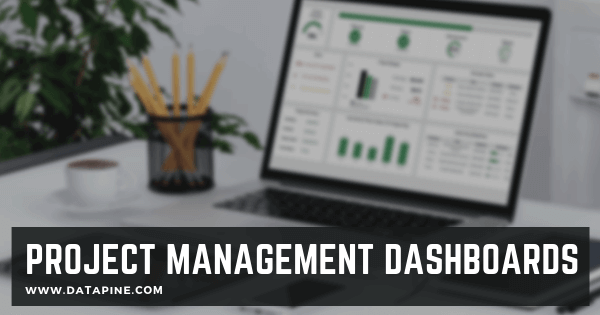 Dashboards project management comes with a host of benefits to any modern organization regardless of industry or niche. The key to successful project management is communication. If everyone involved in a particular strategy or initiative understands their role, has access to the insights they need to perform their tasks to the fullest potential, and understands the data before them, your project is likely to exceed expectations and bust targets. Working with project dashboard software that can create extensive analytical reports will bestow your strategic activities with all of these key attributes. In today’s digital business landscape, projects can become complicated due to the sheer number of platforms or touchpoints to consider, coupled with the significant piles of data available at any one time. Project dashboards present and visualize the data that’s 100% relevant to a particular project, and as every insight is available in one central location, it’s possible to gain swift access to all of insights or metrics that are integral to your project without logging into other applications or platforms. And this is the essence of what is a project dashboard –time and money saved. By working with a specific KPI template that is relevant to the task at hand, a live dashboard makes it possible to track, measure, and improve your performance from start to finish. Moreover, by gaining the ability to compare digestible visual data, you can spot trends, capitalize on strengths, identify weaknesses, and improve the success of your projects significantly. What To Look For In A Perfect And Modern Project Management Dashboard? When you’re in the middle of delivering a project, chances are the pressure will be on, which means that to hit your targets and get things done, gaining instant access to the right information is paramount. Any robust project management tool will be visually digestible, well designed, and serve up insights in a way that lets you extract value from them in seconds. In addition to digestibility (or ‘scannability,’ as it’s sometimes referred to), it’s essential for project management dashboards to be completely user-friendly. Not only should everyone within the organization be able to navigate your online dashboards with relative ease, but it shouldn’t take technical staff to intervene and conduct data-driven tasks on a regular basis. In short, any project dashboard worth its salt will allow all departments to work with the data that’s most important to their role in a particular project, without fuss. Another key attribute of project-based software is portability. A robust data dashboard will offer its users access on a variety of media, from desktop to mobile app, providing fully-optimized, user-friendly access to essential project data 24/7 no matter where you may be in the world. Finally, it’s essential for your project management dashboard to be fully customizable. By customizing your BI dashboard, you’ll be able to set KPIs that are most relevant to your project while integrating platforms and services that are most useful to your activities and choosing designs or layouts that will prove the most helpful to you and your colleagues. Now that you know what to look for, put these qualities and features into real-world context by exploring these 2 essential project dashboard examples. They provide an overview for projects conducted in IT and marketing but can be used for other projects as well. Let’s see this in more detail. This project dashboard template is the first of our 2 project dashboard examples, and it focuses on the steps and tasks involved in delivering a very specific strategic IT-based initiative successfully from start to finish. Regardless of your industry or sector, if the Chief Information Officers (CIOs) want to deliver more value and have a more significant impact on the business, they must align with the company’s core strategic priorities. To achieve this, IT-driven dashboards make priceless tools. Every IT KPI and visual element in this IT-based project management tool helps to drive efficiency, communication, and cohesion, drilling down into task-management and delivery, deadlines, and specific workloads. By gaining a panoramic view of these insights, it’s possible to make your company’s IT projects more time-efficient, cost-effective, and results-driven than ever before. Let’s explore the core KPIs of this IT dashboard in more detail. Total Tickets vs. Open Tickets: This particular KPI helps enhance the overall performance, efficiency, and delivery of your IT projects by carefully monitoring progress and workloads. It will form the foundations of your project’s overall success. Projects Delivered on Budget: This invaluable KPI offers a detailed, accurate evaluation of your ability to remain within budget limits. If you learn how to stay within budgets, your projects will be all the more effective and efficient. Average Handle Time: The average handle time KPI provides an invaluable insight into how well you’re handling your projects in term of timeframes, delivery dates, and deadlines. An essential component of successful project management. Without effective, target-driven marketing strategies, your business would never grow or evolve. This marketing dashboard template focuses specifically on your organization’s promotional initiatives. Agencies can also use it to monitor and manage the performance of campaigns and projects for their clients while creating comprehensive marketing reports used in this fast-paced industry. The marketing performance dashboard is an invaluable project dashboard template as it gets straight to the heart of your promotional campaigns’ cost-efficiency, target-meeting capabilities, levels of engagement, and click-through rates. 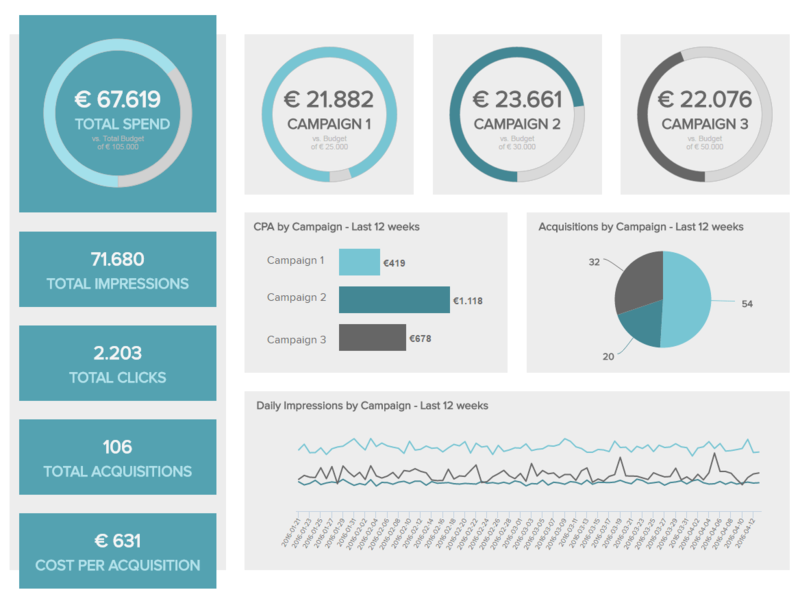 This marketing dashboard provides an ideal overview of all your campaign performance data across every relevant marketing channel. Moreover, it showcases all of the insights you need to decide where to place your marketing budget in the most informed, strategic way possible. Let’s glimpse at the KPIs that make this integral dashboard tick. Click-Through-Rate (CTR): An essential marketing metric, your click-through rate offers a clear-cut indication of how much your promotional content, assets, and communications are resonating with your target audience. Cost-per-Click (CPC): This is an essential marketing metric as it offers a comprehensive overview of how much your various promotional ad spend is costing on each channel and how effective each activity is to the success of your project. Cost-per-Acquisition (CPA): By understanding how much your various promotional initiatives are costing you in terms of acquiring a new customer or conversion, you can make strategic tweaks that can save you money while boosting your success. Your CPA will help you do just that. Indeed, communication, intelligence, and insights from the very foundations of managing and delivering a successful project from start to finish. If you want all of your projects to surpass your goals and drive your business to dizzying new heights, project management dashboards are without a shadow of a doubt the way forward. Embrace the power of project management technology, and great things will happen for you and your business. If you want to start building your own dashboards and take control over your projects, you can try our software for a 14-day trial, completely free!